After your chicken lays an egg, the egg can either be taken away from the chicken and used for human consumption or it can be incubated until it fully develops into a healthy baby chick. It takes a chicken roughly 24 hours to form an egg inside her body and an additional 21 days after the egg is laid for it to hatch. Your chicken's egg starts forming when the yolk forms during ovulation inside the hen's ovary. At this point in development, the yolk is called an oocyte. After the oocyte has formed, your hen's ovary releases it into the oviduct. If the hen has access to a rooster and has mated with him, the egg will be fertilized while it is in the oviduct. The oviduct is more than 2 feet long. The forming egg rotates as it travels through the oviduct, developing the egg white around the yolk. In the lower part of the oviduct, the egg shell forms and develops its color. The egg is laid after it finishes passing through the oviduct. The newly laid egg may or may not contain everything it needs to develop into a baby chick, depending on whether or not it has been fertilized. 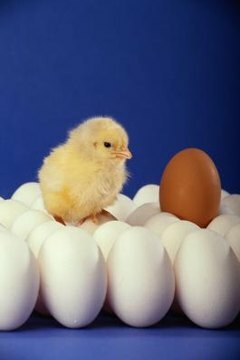 If the egg is fertilized, it can be incubated in a specially designed incubator or cared for by a broody hen until it hatches into a chick. While the embryo inside the egg is developing, the unhatched chick will use the yolk inside the egg to provide the nutrition the chick needs to grow and develop. Sometimes chickens will lay flawed eggs. Common egg problems include eggs that go through the oviduct too quickly and come out of the hen while they are still very small. Eggs can pass through the oviduct without developing hard shells, creating soft-shelled eggs. Chickens who are sick or are under significant stress may produce misshapen or otherwise flawed eggs as well.